In addition to specializing in preventive waterproofing on new construction. 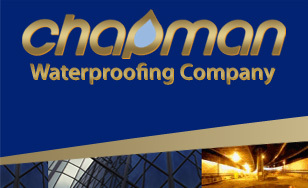 From waterproofing a tunnel under a river to preventive waterproofing on a new skyscraper, the construction industry depends on Chapman Waterproofing to protect their investments. Chapman is primarily active in commercial, industrial, and institutional construction for municipal and private projects. Our principal service is as a contractor, but we also offer waterproofing and restoration consultation services to architects, engineers, and building owners on new construction and rehabilitation projects.